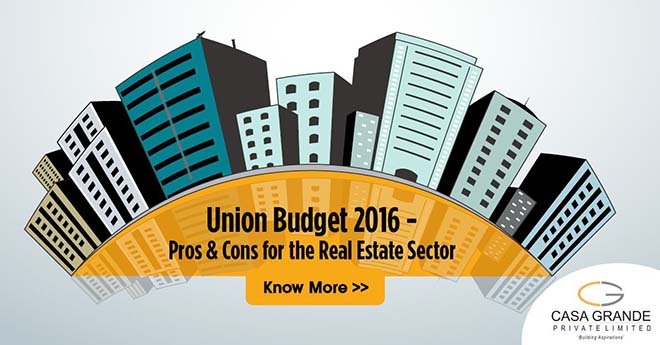 The real estate sector had high expectations from the Union Budget 2016-17 and it has turned out to be a mixed bag. The government is committed to three key initiatives – Housing for all, hundred Smart Cities and Affordable housing, which will provide a boost to the real estate sector. However, some key policy and regulation expectations have been ignored. Here are some of the hits and misses of the Budget 2016. However, the cost of the house should not exceed Rs. 50 lakhs. Service Tax on Construction of affordable houses up to 60 square metres has been exempted. Excise duty exemption, presently available to Concrete Mix manufactured at site for use in construction work, has been extended to Ready Mix Concrete as well. This should be a factor in pricing of new homes. 100% deduction for profits to an undertaking from a housing project for flats upto 30 sq. metres in four metro cities and 60 sq. metres in other cities, approved during June 2016 to March 2019, and is completed within three years of the approval. The Real Estate Bill has been passed now as a follow-up to the budget, which will bring in more transparency in the sector. In the last two budgets, the government had simplified the path for Real Estate Investment Trusts (REITs) listing in India. In the current budget, the Dividend Distribution Tax (DDT) on REIT has also been scrapped. This move will help real estate developers to soon announce the first REIT listing in India. The rate of Service Tax on real estate will increase 0.5%. This will burden home buyers who are already burdened by increase in local stamp duties. The real estate industry has been asking for a single window clearance in order to reduce the time and hurdles involved in getting approvals. But this request was not addressed in the budget. Krishi Kalyan Cess, at the rate of 0.5% of value of taxable service, imposed with effect from June 2016. There was also no announcement in the budget about the infrastructure status for the real estate sector. The infrastructure status grant will result in low cost of funding from banks and hence, reduction in project prices. Although 100% deduction for profits to an undertaking from housing project has been sanctioned, Minimum Alternate Tax (MAT) will still be applicable.